Flowers in a box choose beautiful hand-picked fresh flowers from the market. They then carefully pack the flowers by hand into boxes and deliver the flowers to you. The excitement begins when you open the box to reveal the surprise of the beautiful flowers inside, ready for you to lovingly arrange and enjoy. 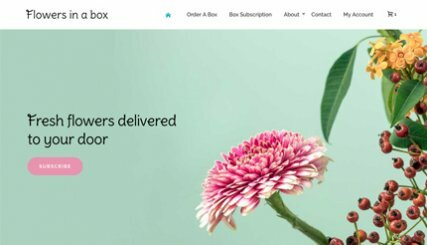 The new website, complete with Limelight produced illustrations, is powered by WordPress CMS and allows you to select a mixture of blooms on subscription, as a single/regular one off order or as a gift - all with the added bonus of delivery within the Christchurch area. Flowers in a box was a dream of mine and Limelight Online has had a massive role in making my dream come true. From my initial phone call to the launch of the website it has been an absolute pleasure working with the team at Limelight Online. Suzanne has been super amazing to work with, helping me understand and work through the whole process. I knew nothing about creating a website and have felt totally supported and educated throughout the whole project. Mark is a creative genius and has produced not only the most amazing graphics but also a website I love.